As the weather gets warmer you need something cooler, lighter. Rosé wine was until few years back considered an easy uncomplicated poolside wine, served at summer parties in a plastic cup with ice cubes to satisfy one’s thirst on a hot day. A very misunderstood wine, which received lots of criticism because of its “girly” pink color. However recently, Rosé wine started to gain in popularity and it is becoming a serious business. After all, it is not an easy job to be the perfect flavor balance between red and white wine. Mixing red and white wine together is NOT how you make rosé. To make most rosé wine, red grapes are lightly crushed and left to macerate with their red skins [which contain the colored pigments and tannins] for a little while, it can takes from few hours to few days, [The longer the skins are left in contact with the wine, the darker the color of the rosé will be] after which the juice is separated from the skin and fermented in tanks. So the different ranges of pink, is the result of the grapes variety used and the amount of time it was left in contact with the skin. Rosé, unlike red wine does not improve over the years, the newest vintage = the freshest wine. Choosing a French traditional dry rosé is always a good choice, after all France is the motherland of Rosé wine, it’s hard to go wrong with anything from Provence, the Rhône valley, or the Loire valley. 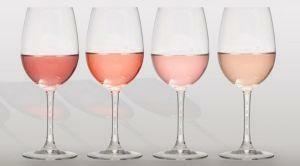 Rosé from Provence tends to be very pale pink, sometimes salmon-colored. Also a great option, if you’re not feeling the French stuff: Italian Rosato And Spanish Rosado both tend to be with deeper pink color and up-front fruit flavors that work well with meat. From a food pairing perspective, the Rosé wine is perfect. Just the right amount of acidity and body to match almost any meal! It is refreshing and goes beautifully with just about any casual food from Steaks, BBQ, picnic food, to fish and vegetarian selection.